Five years is a long time. And when a dance company reaches this significant birthday, especially in this artistic climate, it is a big deal. Post:Ballet’s fifth summer program has the requisite celebratory perspective that this milestone calls for. There was an occasion to gaze back into the company’s repertory archives with Artistic Director Robert Dekkers’ “field the present shifts” (2013) and “Mine is Yours” (2012), as well as an opportunity to look forward with the newest premiere “ourevolution”. While all three pieces were incredibly unique and distinct, a common atmosphere of relatability and egalitarianism permeated the evening. Especially fitting for a company who genuinely values an ongoing relationship and active conversation with their audience. Post:Ballet dancers in "field the present shifts"
Caldwell). Favorite moments include the ‘group huddle’ where each dancer’s leg is extended high into the air, the statue sequence, and Aidan DeYoung’s amazing developpé toward the end of the work - à la second with the standing leg in fondue. But this year, the universal sense of circumstance stood out, a situation that everyone can relate to. 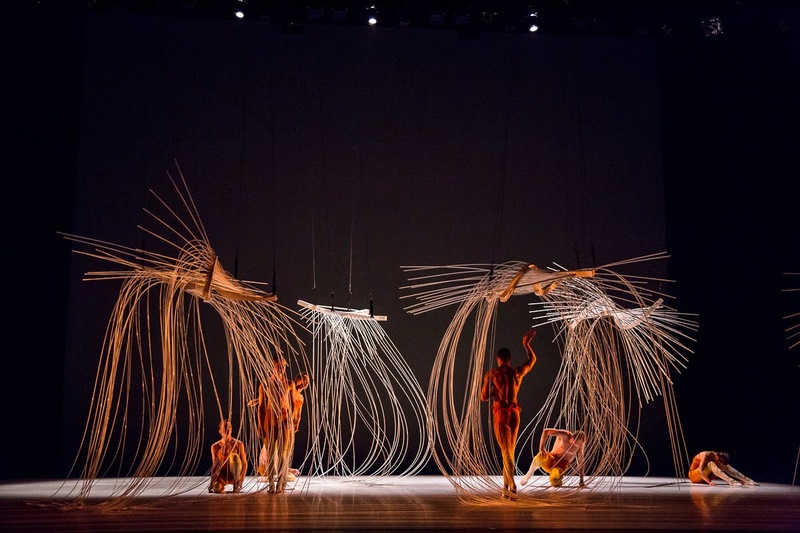 Throughout “field the present shifts”, chance compositional technique is utilized, where the dancers are invited to make guided decisions in the performance. This was evident in the unison segments where performers cycled through the choreography at different speeds and with their own pulse, timing and rhythm. Similarly, the calisthenics sequence (with a set of punctuated gestures and movements) also implied some real-time decision-making. Some of the ensemble held particular poses, while others continued on. Changing circumstances; lack of control; adapting and adjusting to the unexpected - an egalitarian experience for sure. Following intermission, Laura Mead, Laura O’Malley, Caroline Rocher and Ricardo Zayas took the stage in “Mine Is Yours”, a haunting quartet from 2012. The mysterious, almost eerie quality in this short ballet makes another comment on egalitarianism, but this time from within the narrative. The first moments of the work find the trio of women standing in a line facing upstage. Arms extend to grab something, but then retract before acquisition. Then, they near Zayas trepidatiously tiptoeing on high demi-pointe, like they are unsure if this is really what they want. From time to time, Zayas also approached each woman, walking in a bent over position, unable to look them in the eye. Last, there was a recurring motif where the dancers slid into the splits, but never quite getting all the way there. Dekkers’ “Mine Is Yours” reveals a shared, broad message about vulnerability, hesitancy and the inability to go ‘all-in’. y of individuals who know each other, yet there is distance. They wore hooded jackets and sheer face covers (which are discarded over the course of the piece), making them invisible and anonymous, yet visible and obvious at the same time. The action unfolded behind a scrim that also fulfilled a dual role. First, it provided a platform for the phenomenal animation (by Yas Opisso with additions by Stephen Goldblatt), and it also served to create an extra level of narrative detachment in the piece. The animation was super interesting in its own right but when paired with the choreography, took on new and deep meaning. Specifically during Katherine Wells’ solo as she interacted with the geometric animated shapes, throwing and catching them. Choreographically, “ourevolution” evolves and crescendos over its twenty plus minutes into some complex, inspiring and technically demanding solos, duets and group sequences. Though towards the end of the dance, the walking theme returns - again, a pedestrian statement of egalitarianism. The audience knows this movement; they participate in it everyday, and so, can see themselves in the work. In the past half decade, Artistic Director Robert Dekkers has created a successful, thriving and influential arts institution with Post:Ballet, but what ‘Five High’ truly reveals is the journey of an artistic family; a cohesive and committed group of professionals that has gelled creatively and grown together. It is going to be a joy to see where Post:Ballet is five years from now.